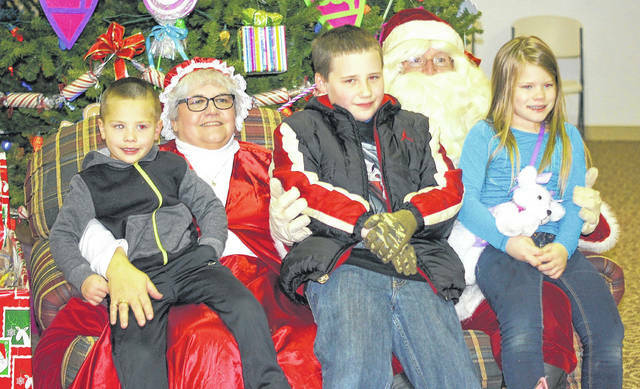 File photos Hometown Christmas downtown Nov. 24 will include a visit with Santa. 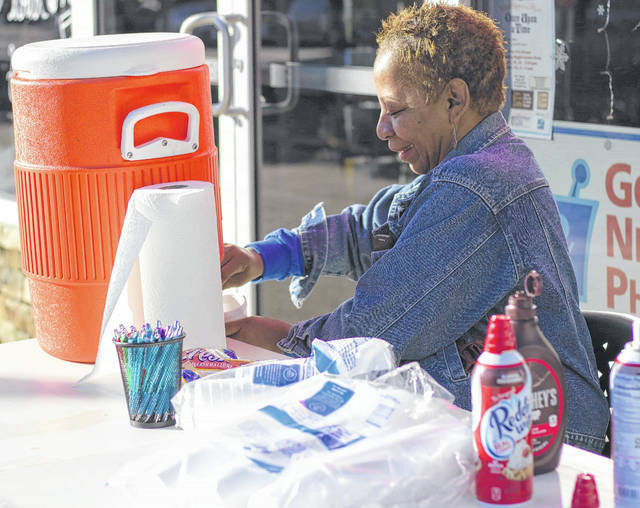 Ms. Lacy offers free hot chocolate outside Barr’s Hometown Pharmacy in 2017, one of Xenia’s small businesses. XENIA — Two events. One city. That’s what Xenia residents have to look forward to Saturday, Nov. 24 when the downtown area will be abuzz with Hometown Christmas and Small Business Saturday. The annual Christmas-themed event begins downtown, running 12-4 p.m. and continues 2-9 p.m. at Shawnee Park. It features food trucks, games, horse and carriage rides, kiddie train rides, and the famous light show 7 p.m.
Santa will make an appearance 2-5:30 p.m. and is scheduled to arrive by antique firetruck. The Xenia High School choir ensemble and jazz band will perform, following by a concert by a 6 p.m. American Idol finalist Alexis Gomez, who makes a return trip to the event. “I believe it will be another spectacular event as it was last year,” Xenia City Council President Mike Engle said. The small business portion of the day features more than 20 downtown businesses including: Antique Alley, Bullskin Trace Antiques, Coffee Hub, Courthouse Coffee & Cafe, Devil Wind Brewery, Eichman’s, Flour Bake Shop, The Flower Stop, Greene County Republican Party, Gypsy Alley Boutique, Live Better Massage & Spa, Live & Let Dye Hair Salon, Loan Star Pawn Shop, Mary’s Odds & Ends, Our Family Soap, One Bistro, Rusty n Chippy’s Vintage Antiques, Sweets Boutique, Table of Contents, Tori & Co., Toward Independence, Triple J’s Comics and Collectibles, Wendy’s Jewelry Gallery, X*ACT, Xenia Smoke Shop, and Xenia Shoe & Leather Repair. The idea is to give residents an early start to holiday shopping while supporting local businesses. Most stores will be open until at least 4 p.m. and many will have extended business hours. There will also be many businesses who will decorate their store front windows for the Window Winterland Window Decorating Contest. Window shoppers may vote for up to five of their favorite store front windows by scanning the QRCode at each participant window or by visiting http://bit.do/vote4mywindow2018. Windows with the most overall votes win the people’s choice award. Voting begins 5 a.m. Friday, Nov. 23 and ends 11 p.m. Monday, Dec. 10. Winners will be announced Friday, Dec. 21 on the Downtown Xenia Facebook site by 11 p.m. and prizes will awarded at a Xenia City Council meeting in early 2019.
https://www.xeniagazette.com/wp-content/uploads/sites/32/2018/11/web1_DSC02815.jpgFile photos Hometown Christmas downtown Nov. 24 will include a visit with Santa. https://www.xeniagazette.com/wp-content/uploads/sites/32/2018/11/web1_LacyBarrsPharm.jpgMs. Lacy offers free hot chocolate outside Barr’s Hometown Pharmacy in 2017, one of Xenia’s small businesses.